Never worry about clogged bathroom drains again. This patented strainer catches long hair and other debris before it can cause a problem, so your pipes will remain clean and clear. It's perfect for humans with long hair, but it's also nice when giving dogs and cats a bath. 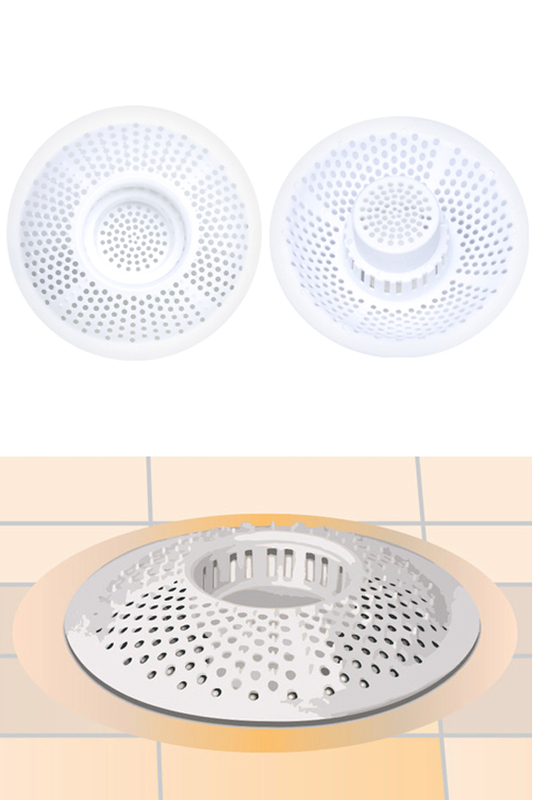 The dome shape creates a high obstacle without reducing water flow, and the added spikes help to grab onto thin strands to prevent them from washing through. The center column fits down inside the drain for a snug fit, and the large dome rests flush against the bathtub surface. Water will pass just like normal, but hair and dirt will be prevented from getting through. Nothing will slip underneath, and no hair or fur will be able to flow over the top. An ample number of holes and slots ensure proper water flow, and the advanced design is compatible with most tubs and showers. Stop wasting money on products to clear the drain, but don't stand in a pool of dirty water either. Take a few seconds to install this handy device, and you'll never have to worry about hair washing down the drain again. Effective. Incredibly capable with all types of hair and fur, this advanced strainer will collect floating debris efficiently, and without any annoying side effects. Flexible. Although it's rigid enough to hold it's shape for a lifetime, it's also flexible enough to avoid pain when accidentally stepping on it, and ease cleaning when it gets full. Compatible. It works just as well in almost any tub or shower, so buy with confidence to solve your shedding problem, and prevent backed up drains. Large. The extra large dome allows it to work on a variety of tubs and showers, but it also improves performance. You'll have ample surface area to catch hair, and even when it piles up, the water will not slow. Reusable. 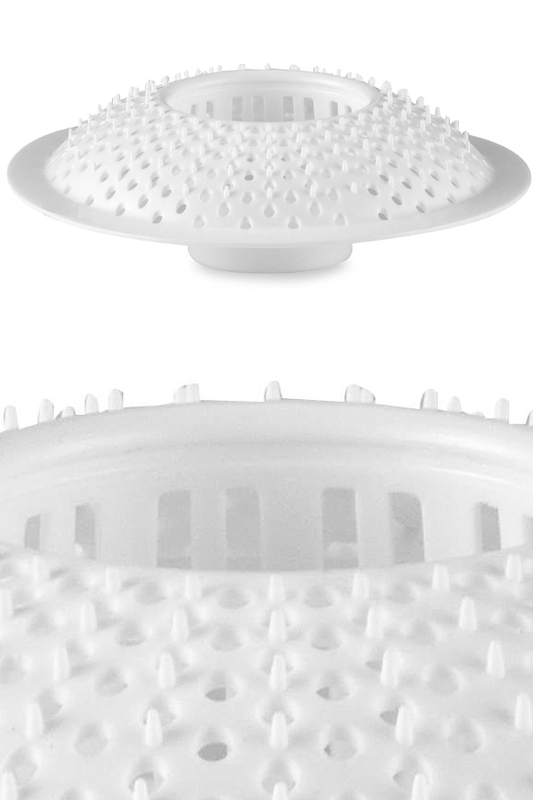 Easily washable when it gets full or dirty, this drain protector can be used over and over again. Most hair and debris will get caught on the domed surface instead of collecting down in a tiny hole like with other options. 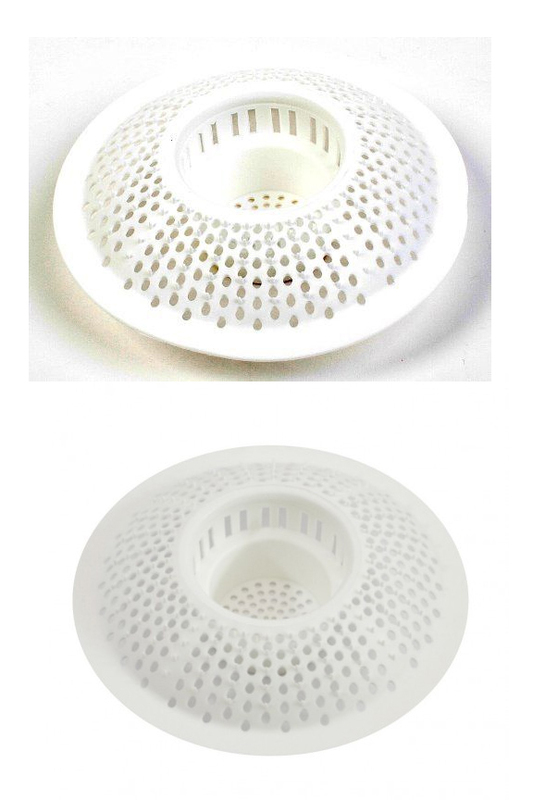 Incredibly simple to use, this drain strainer will replace what you have now. Anyone can install it in just seconds, but follow the instructions below to ensure proper function and long lasting performance. In most cases, you will have to remove the metal strainer already in place. You may need a screwdriver to loosen and remove the single screw holding it in place. Once the drain hole is clear, simply place this hair stopper in the middle so that the smaller tube at the center fits down inside the drain pipe. The remainder will sit flush against the tub or shower surface. You can keep it in place at all times, or you can set it in place, only while draining. For showering, it will remain snug and in place. When plugging the tub for a bath, you should remove it to avoid floating, and then put back in place while draining. Once installed, water will flow through the holes, but hair and other debris will be prevented from passing. For occasional cleaning, remove and empty into trash, or rinse under faucet to release debris. Dimensions 4.75" x 4.75" x 1.5"
Uses Insert into bathtub and shower drains to prevent clogs. Hair and other debris get caught before entering the drain in order to keep pipes clean. Allows for fast flow of water while blocking every stand of hair. Recessed Design Yes. Designed to fit inside most drains for maximum efficiency. Added Spikes Yes. Small holes allow water to flow, and block larger debris, but the addition of little spikes help to grab hair and other smaller particles too. Compatibility Fits most bath or shower drains. Just remove the ineffective metal strainer, and set this one right in the hole. It stays in place, but is easily removable for cleaning or replacement. Water Flow High. A large number of holes and slots allow for free flow of water, even while stopping long hair and other dirt. Stop wasting money on drain cleaners, and don't stand in a pool of dirty water when trying to get clean. Never worry about bathroom drains clogged with hair once you have this in place. Water will wash down the drain just as quickly, but every strand of hair will be denied entry. Perfect for humans with long hair, but also nice when bathing pets. Order Yours Today! It catches all of my hair, as well as my husband's, and our (2) dogs. After my husband took off the drain cover, my job was to clean out the drain (as far as I could) - - YUK! Then the hair stopper drain protector fell into place. It is so easy to clean out; most of the time, it doesn't even need to be removed. Great product! Havent used it yet. I shower, don't always use tub. A tub drain strainer that's guaranteed to collect every strand. Works with human hair or pet fur!